There are those days you have no time. You have to get out the door in the morning and will be getting home late. The temptation is to bring home fast food. Don’t do it! 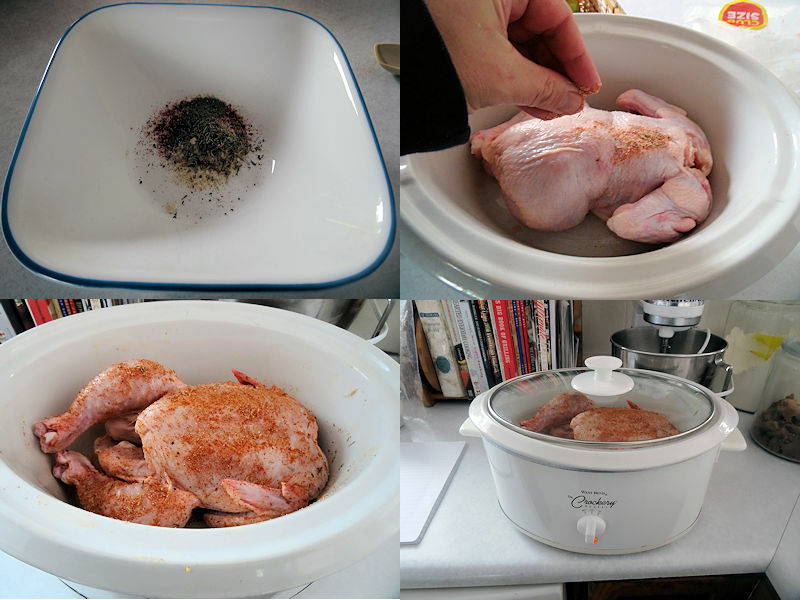 Try this ultra easy and quick chicken roasted in a slow cooker. I rinsed a 2 1/2 pound chicken inside and out. I patted it dry with paper towels. I sprayed the inside of the slow cooker with baking spray. I mixed up the rub ingredients. I put the chicken in the slow cooker to apply the rub. That way, any that falls off stays in the cooker. I rubbed all sides of the chicken with the rub, turned it breast side up, put the lid on the slow cooker and turned it to low. Do NOT add any liquid. After 7 hours, I took the chicken out. The chicken will fall apart as you take it out. Tent it with foil. Pour the liquid into a measure. Use a turkey baster to pull the liquid off from below the fat and put it in a saucepan. Add the chicken stock and bring it to a low boil. Mix the cornstarch and water together and pour it into the stock. Heat and stir until thickened. 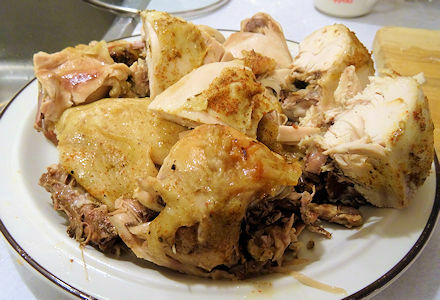 Cut the chicken into chunks and serve it with the gravy. 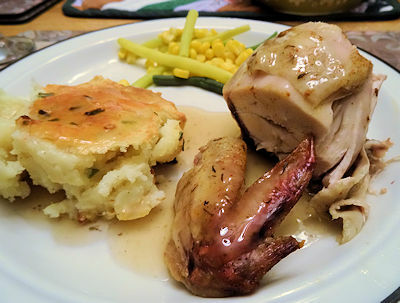 We served ours with Mashed Potato Casserole we had in the freezer and steamed mixed vegetables. This is a very tasty moist chicken. It is fall off the bone and has the texture of a bird roasted in moisture. The skin is not crispy but it is soft and flavourful. This is way better than anything you would pick up in the convenience section of the supermarket. Spray the slow cooker with baking spray. Rinse the chicken inside and out with cold water. Mix the salt, paprika, onion powder, thyme, sage, savory and pepper into a rub. Put the chicken in the slow cooker. Rub all over with the rub. Turn the chicken breast side up and cover. Do not add any liquid. Cook in the slow cooker at low for 7 to 8 hours. Remove the chicken to a platter. It will fall apart. Tent the chicken with foil. Pour the liquid into a measure and remove the fat. Add the chicken stock to the liquid and bring to a low boil. Mix the cornstarch and water into a slurry. Stir the cornstarch slurry into the stock. Heat and stir until thickened. Taste and add salt or pepper if needed. Remove from heat. Serve the chicken with the gravy.